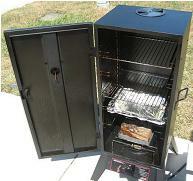 These cookers range from very inexpensive, $50 bullet-type units to $20,000 commercial models. While there are many variations, they all share some common attributes. 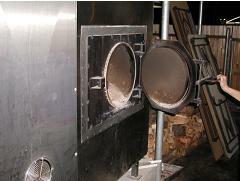 These pits are essentially electric or gas-fired ovens. They’ll cook food, just like your kitchen oven, without logs, chunks, chips, or charcoal. This makes them illegal for competition under Kansas City Barbecue Society (KCBS) rules. Since the primary thermal power is regulated by thermostat or burner control, they control temperature automatically. They have provision for adding wood to introduce some aromatic volatiles into the system. 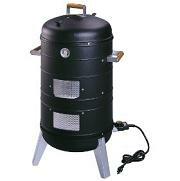 This can range from a small tray for wood chips to a full-sized firebox capable of holding many large logs. These are generally located in contact with the main heating elements or burners, although there are exceptions. The electric models will not make a smoke ring without augmentation. But a lump of charcoal set on the hot element will ignite and provide some NOx emissions. Like most pits, these units can make great barbecue although the requirements for doing so are more complex than they initially appear, especially for the smaller units. As we learned in How Wood Burns, we’ll get great barbecue flavor from clean-burning smoke, but unless you’re into the taste of creosote, things will go downhill quickly as the amount of unburned smoke increases. So the operative question when looking at an electric or gasser pit is, “Will it support a clean-burning wood fire?” This clearly will not happen in a tray of sawdust or in an airtight pit. But it can happen in some of the large, commercial pits with proper attention. In these commercial pits, a tubular firebox is installed through the cooking chamber, with a door at one end and a gas burner/blower at the other. A log fire is built in the tube, and burner plus fire emissions exit from openings in the top of the tube into the cooking chamber. If the pit boss doesn’t stoke the fire, he’ll make pot roast in his gas-fired oven. If he stuffs the firebox with logs and goes home for the night, he’ll have a load of creosote-covered meat waiting for his customers in the morning. To make the great barbecue these pits are capable of, the pit boss must build a real fire in the firebox – one that burns cleanly even when the gas burner cycles off. This is harder than the aforementioned options, but far easier than running a stick burner. In a stick burner, the pit boss has to build a clean-burning fire that also makes exactly the right amount of power. In the big gasser, he just needs a small, clean burning fire – the automatic gas burner will make up the rest of the power requirement. But he does need to be there to tend the fire. Temperature uniformity – the lower-end pits are compact and thus have fairly good uniformity. Some of the mid-range pits require shelf rotation due to vertical non-uniformity. The commercial models are generally engineered with rotisseries and/or convection fans to produce very uniform and consistent cooking conditions.